LinkAngel.com » Blog Archive » Who needs plain old TV with Hulu and TidalTV ? Who needs plain old TV with Hulu and TidalTV ? 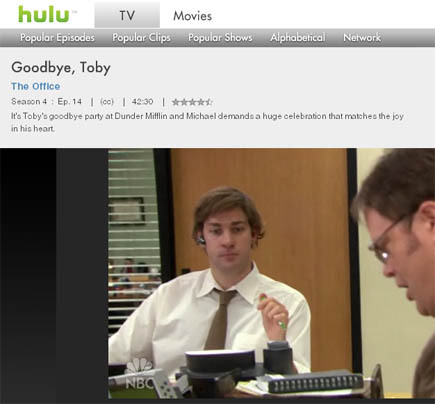 Hulu and TidalTV are two online services that deliver television on demand. The first time I visited Hulu.com, I watch an entire episode of ReGenesis (while at work) and at a pretty acceptable quality level. The programming available is quite vast so that most people should find enough to keep them entertained. The other attraction to this method of entertainment is that one can also comment on what you just watched and make your displeasure known. I did not really care for ReGenesis but so what? I have ‘House’ and ‘King of the Hill’. And that along with news is probably all the TV I watch anyway. Today, I came across TidalTV. This is a service in Beta but looks quite slick. The interface is smooth and fast. I watched a Dilbert animated feature on TidalTV (I’ve never seen Dilbert animations before). The quality again was terrific. Now what this tells me is that, a substantial chunk of broadband users will adopt online TV for their entertainment needs if they have not already and cut their cable bill. For example, you can watch 5 episodes of ‘House’ back to back in any order. Where does TV come close this this? And who likes recording shows when you can have entertainment on demand? By the way, Hulu also has a large collection of ‘Sanford and Son’.